We know you love to ride your bicycle and our BikeBC program helps municipalities fund their cycling initiatives, getting you on your bike. Creating and maintaining cycling infrastructure within towns and cities in BC is the responsibility of local governments and BikeBC supports their efforts. Every year, BikeBC invites municipalities and First Nations to apply for money to pay for the construction of new cycling initiatives in their communities. There is a 50/50 cost-share split. So, if a project’s proposed costs are $2 million, BikeBC will pay up to $1 million of eligible work. Projects are selected for funding based on which applications meet BikeBC’s goals of promoting cycling as a form of transportation such as to and from work, promoting tourism cycling, creating healthy living environments, and reducing traffic congestion and cutting greenhouse gas emissions through safe and effective cycling infrastructure. All applications submitted by the deadline and meeting the eligibility requirements and other funding criteria are awarded points based on the program’s selection criteria. We evaluate the project based on how it improves the safety for cyclists. Separated bike paths get priority followed by cyclist/pedestrian bridges and overpasses, buffered bike lanes that can be separated by physical barriers such as parked vehicles, bike lanes, shoulder bikeways, and shared road ways. Projects are also evaluated on how well they increase physical fitness and healthy living and enhance tourism cycling. Timing is important. Points are awarded if the project coordinates with other construction projects such as sidewalk development and road work. By timing these works we minimize disruption to traffic and reduce the cost of projects. Points are awarded in relation to how many cyclists will actually use the route, the size of the population of where the project is located, what trip generators are nearby, as well as how the route connects to other modes of transportation. We also judge how cost effective the project is based on the projected cost per kilometre, per cyclist, and in relation to the size of the population. Projects will also receive points based on how many tonnes of greenhouse gas emissions they will reduce. 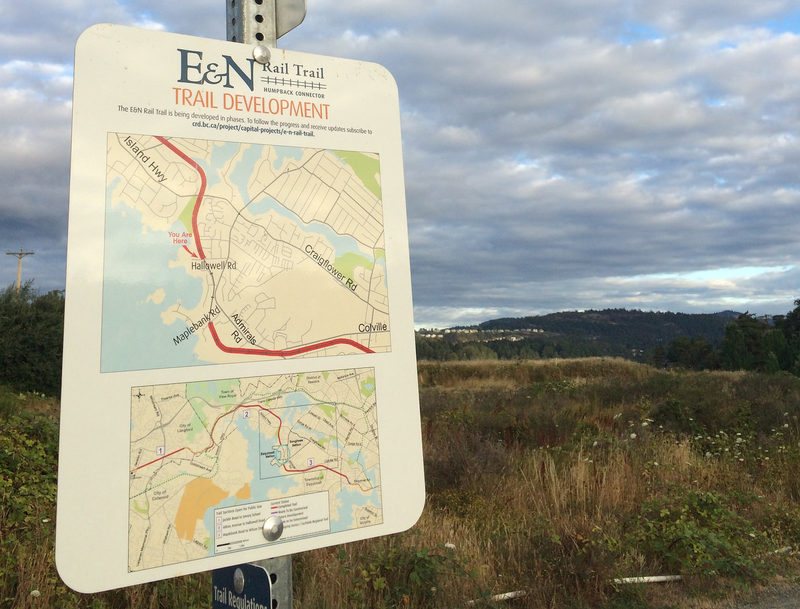 How about The E&N Rail Trail on Vancouver Island? The proposed 17 kilometre cycling and pedestrian trail connects Victoria and the Western communities and its construction is being led by The Capital Regional District representing the local municipalities with support from BikeBC, the Esquimalt Nation, Songhees Nation, as well as the federal government. The CRD has applied for funding of the trail in phases through BikeBC. One phase, Maplebank Road to Hallowell Road, received a high score in part due to the large number of cyclists projected to use the route. It was also judged to be a potential tourism generator and received high marks on reducing greenhouse gas emissions. And the entire one kilometer length of that proposed section of the E&N Rail Trail was completely separated from traffic, giving it top safety marks. The Maplebank Road to Hallowell Road section was awarded $1 million in funding from BikeBC. How do I find out more about cycling infrastructure in B.C.? In addition to the funding provided through BikeBC, the ministry invests in major projects on provincial highways that have cycling components such as the Gateway and the George Massey Tunnel Replacement Project and pays for provincial cycling road and bridge maintenance. To apply for BikeBC funding, visit this link. You can find out more about what your community is doing to support cycling by visiting their respective websites and requesting information on cycling infrastructure found in their official community plans. Some municipalities, such as Vancouver, have a homepage devoted to all things cycling.